We all know that all versions of Windows let you set the default email program that will be called whenever you click on an email link, for example, but what about setting Hotmail as the default email client? In this tutorial, we will show you how to use Hotmail as the default mail client in a particular case, without actually having to change your default email program for Windows. This tutorial assumes that you are using Internet Explorer 8, the latest and current version at the time of this writing. (What version of Internet Explorer do I have?) Because you do not need to change your default email client, this means that you will be able to choose in which case to use Hotmail or use Windows' default mail handler. Some of our other tutorials explained how you can email a link from Internet Explorer, email an entire web page from IE, and how to email a picture from IE. In all three cases, Internet Explorer will automatically use your default Windows email program. Right-click on a web page in Internet Explorer: towards the middle of the context menu, you should see an "E-mail with Windows Live" menu item. If you do not see it, download the Windows Live Essentials package for free. 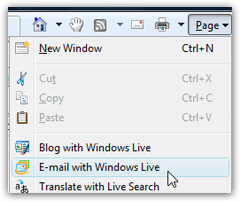 If you have installed Windows Live Mail on your computer (since Windows 7 ships without built-in email program, computer manufacturers often install it for you), you should see the E-mail with Windows Live menu item when you right-click on a web page. If you click on it, this action will load a new tab with Hotmail's email editor preloaded, using the web page title as subject and the URL (web page address) inside the body of the email. Regardless of your default email program, clicking E-mail with Windows Live will always send the email with Hotmail. This, in effect, makes Hotmail your default email program in addition to Windows' default email application! If your command bar is showing on the right of the browser tabs, you can also go to the Page menu, and choose E-mail with Windows Live. This has exactly the same effect as the command in the context menu, and will email a link to the current page using Hotmail as the default email application - you can pick your favorite approach to sending emails with Hotmail as default handler! Cannot email a page with Hotmail! If the E-mail with Windows Live menu item is grayed out, this is because you are on a secure page ("HTTPS", with the padlock icon in the address bar), and Internet Explorer is trying to prevent you from emailing a link you did not mean to email, or should ideally not send by email. In that case, you can either avoid emailing the content Internet Explorer is telling you should not be emailed, or use your actual Windows default email program to send the link: File > Send > Link by E-mail, or Page > Send Link by E-mail. Hotmail Tip: Load your inbox with a click! By using Internet Explorer 8, you have the option of using Hotmail as default email program, or an installed desktop email application. When you are in a hotel, or using a public computer, the option of using Hotmail as default program using this indirect method is very handy, since you would not be able to install an email program of your own.